Tomorrow is ANZAC Day. 25th April 1915, was the date of the first landings on the beaches of the Gallipoli Peninsula in Turkey during the First World War. ANZAC Day takes it name from the Australian and New Zealand Army Corp. This is the day when Australians and New Zealanders everywhere recognise those who have made a sacrifice for their countries. The ANZAC Day Public Holiday will see many Australians, young and old, at Dawn Services across the country. This is now a proud celebration of the nation, in stark contrast with the event that looked as though it would die out with the passing of our WW1 survivors in the 1960’s and 1970’s. With one WW1 veteran left in Australia and many WW2 survivor now in their 80’s ANZAC Day is growing in popularity, “Lest We Forget”. 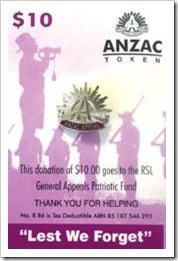 * CannibalRabbit supports ANZAC Day, Legacy, and Remembrance Day.